We are so lucky to have wonderful outdoor show jumping venues in Sussex, and the Light family's showground at Pyecombe is one of the best. Nestling in the downs, with a fantastic new arena and all their lovely young horses and mares and foals grazing above the rings. Having only returned from Keysoe on Thursday night, and having had a lovely sociable weekend, it took a bit of commitment to be up at 5.00 on Monday morning all ready to jump at Pyecombe. However, an excellent four day schedule combining young horse classes and a 1.40, 1.35 and an Area Trial was too good to miss, even though we only jumped on the last two days as the horses needed time to recover from three days' jumping at Keysoe. Benny jumped a good round in the 1.20, and Catokyo then jumped in the last five year old qualifier. She jumped beautifully, but a sat-nav moment between fences one and two is pretty dippy even by my standards and prevented her from qualifying for the final. Emma jumped a great double clear in the 1.30 so I decided that jumping the 1.40 as well was a bit greedy and we called it a day. Tuesday was another early start for Benny who jumped a beautifully in the 1.20, giving me loads of confidence and making me feel I have just about cracked riding him. We then had a bit of a wait for Emily Moss, who keeps her lovely Mai with us, to jump a really good round in the British Novice, before taking Benny and Mai home and fetching Catokyo and Emma. Emma jumped a cracking clear in the 1.35 to finish just out of the money and Catokyo jumped well in the Newcomers in the main arena. Many thanks to Heather Trevor-Jones and Steff Gibbs for their invaluable help and videoing at Pyecombe. Having worn two coats for both days at Pyecombe only one week later we were jumping in shirt-sleeves at Coombelands. This is another absolutely beautiful venue, owned by the Harwood family with fantastic views over their gallops and cross-course to the South Downs, they have installed a fantastic all-weather arena, with a huge warm-up as well. I was keen to jump one more Newcomers with Catokyo before Hickstead. This was a good decision as she was very distracted by being in a new arena, especially when close to the spectators and a slight lack of steering caused me to turn a circle. 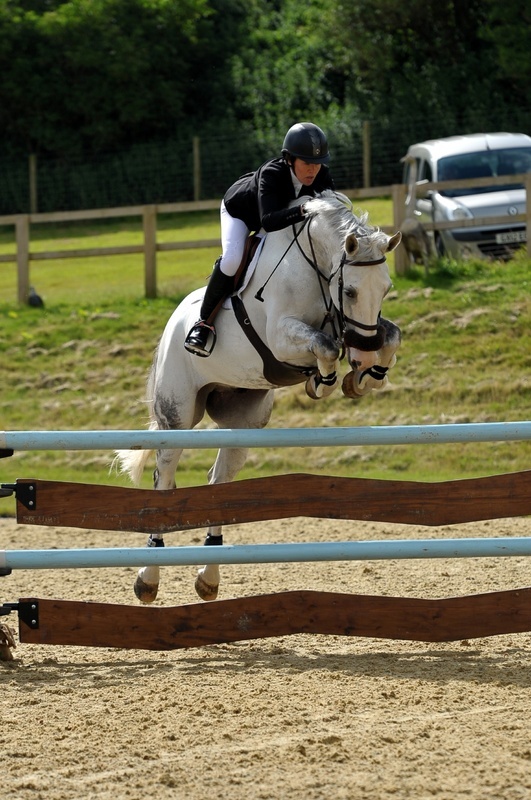 We then were allowed another round "hors concours" and she jumped round beautifully. She may not be very big, but Catokyo is the most effortless and impressive jumper. I am absolutely thrilled with her and really excited to have another such lovely youngster to work with. Benny jumped a fantastic round in the 1.20. He feels completely different now he is completely fit and we are starting to really understand one another. He has a huge, scopey jump and is very generous and kind to me, and seems to be getting the hang of having a rather small person trying to give instructions on top! I am thoroughly looking forward to the Royal International at Hickstead which starts on Tuesday next week. We are lucky that the South of England Show is very local, it is a typical, old-fashioned county show and provides not only excellent experience for younger horses, but also top class jumping and good prize money for the older horses. Having decided that Catokyo and I weren't quite together enough to leap straight into a Newcomers, Heather Trevor-Jones and I set off very early on Thursday morning with Culana Z, Benny and Doonaveeragh Emma. Culana Z jumped very well in the Newcomers for one fence down in the jump-off. She has progressed so much in a relatively short time and I just love riding her. We then had a chance to watch the Area International Trial in the main ring before it was Benny's turn to jump the 1.25. He worked in well, he is getting fitter, and really perks up when he gets in the ring. I just let him make up too much ground in a distance, but otherwise he jumped well. Doonaveeragh Emma then jumped a fabulous double clear in the 1.35 to finish 3rd - she such a clever little horse. Friday was another early start - this time for Steff Gibbs and I. Culana Z felt excited but tired and jumped rather greenly in a slightly stronger Newcomers. I then rode both Benny and Emma in the 1.30. A quite brave decision for me with Benny and I felt very nervous - but he jumped fantastically - just let down by me not getting him straight at the first fence. Doonaveeragh Emma jumped another great round to be placed. On Saturday Steff, Mark and I had a more civilised start with just Emma for the 1.40 Accumulator in the main ring. She jumped a really good round just having the 6th fence, which was the bogey fence, and the joker - which only fell once we were through the finish. Mark and I took her home quickly and then came back to watch the Grand Prix and the Inter-hunt relay and to spend a relaxing afternoon with friends. It was lovely having Zandra, my stepmother, and her friend David Brookes to stay for the show. They are knowledgeable and enthusiastic supporters and a tremendous help as well. Four days after getting home from Spain I was packing the lorry for Hardelot. It did feel a bit mad, but Hardelot is a lovely show, one of the early season shows on grass in Northern Europe and it fitted well with giving Culana and Lima a break after Spain. At 3.45 on Wednesday morning Heather Trevor-Jones, Emma, Luendi and I were on our way to Folkestone and by 9.30 we were unloading in Hardelot. The Breen Team and Jake Saywell beat us to it having left Hickstead at midnight, but I cannot drive the lorry and make a sensible job of riding the horses on no sleep, which is where the Eurotunnel comes into its own taking a couple of hours off the journey. Hardelot is held on in the town, and there is no parking: you queue to unload in a residential street and the lorries then park along the roads round the golf course, hence the need to arrive before too many other people. This year the urgency was increased by very wet conditions and the scarcity of unflooded stables. Once Heather and I had settled the horses and I had parked and hooked up the lorry I rode and trotted up both horses and declared Luendi to jump on Thursday. Only Luendi jumped on Thursday. She jumped in the 1.20 but the very muddy conditions were hard for her and she was a bit disappointing. On Friday both horses jumped in the 1.25 speed. Luendi jumped a great round and Emma was 6th. It was still tacky ground but lovely for Emma to cruise round a small class. Luendi was the perfect mount for the prize giving. The French make a fantastic fuss of prize givings with the top eight mounted, bags of enthusiastic commentary and several laps of honour - Luendi was very polite, whereas Emma would had been electrified. 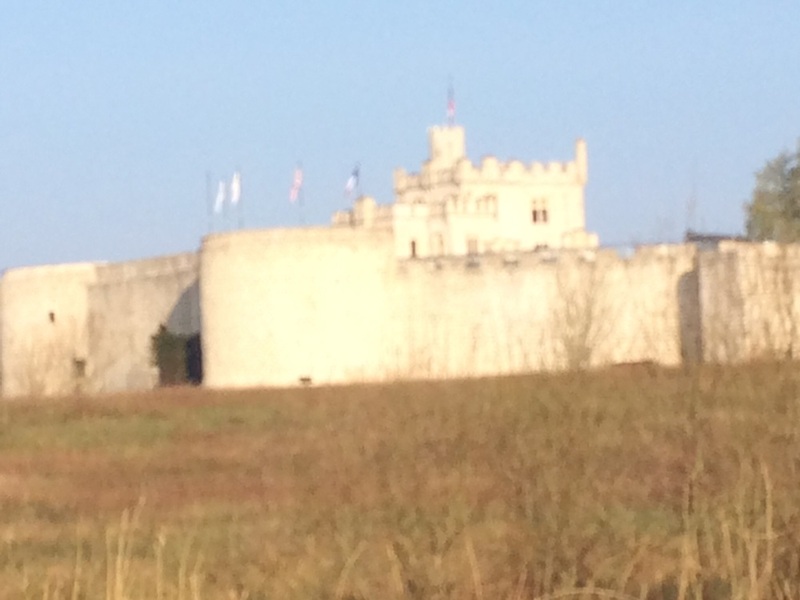 Hardelot was a show with a few glitches: as we got onto the autoroute in Calais the back tack locker was open (we got the whole way to Folkestone with it closed). Heather bravely battled the traffic to shut it, but when we arrived at Hardelot Emma's top rug was found to have joined the humanitarian effort in Sangatte. Simon Moss managed to get the water heater, which failed to work in Spain, working before we left for France, but on Friday afternoon hot water started gushing out of the lorry necessitating turning off all the water and showering in the show showers, which actually weren't too bad and had an endless supply of hot water. As my class was later on Saturday I took Emma for a quiet hack along the bridle path out of Hardelot which was absolutely beautiful. Both horses jumped in the 1.30 small Grand Prix. Luendi jumped well for her first 1.30 which was strong and on tacky ground and Emma was a bit wild for two down. Saturday evening was spent celebrating Chloe Breen's birthday. Luendi didn't jump on Sunday so she had a lovely long hack round Hardelot. Emma had a really unlucky four faults to finish 8th in the Grand Prix. The prize giving was very long, with speeches and loads of prizes and galloping about - very exciting, but we survived. Then we tidied up and I got the lorry into the queue for packing up. This involved 45 mins queuing and 5 minutes packing! There were no space on the train, but we were very quick getting a ferry in Calais and were home just after midnight. Very tired, but quite a good show for Emma and good experience for Luendi.